When words and pictures don’t do the job, consider making video a part of your Word 2016 document with the Online Video command. This command establishes a link between your document and a video on the Internet. You see the first frame of the video in the Word document, as shown here. Clicking the Play button in this frame opens a video viewer so you can play the video. Making video part of a Word document. To insert an online video in a document, go to the Insert tab and click the Online Video button. The Insert Video dialog box appears. 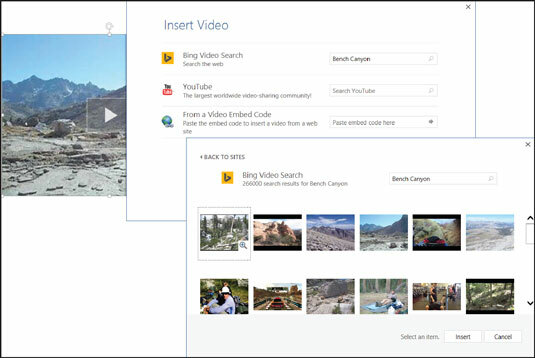 Use it to search for an online video with the Bing search engine, search for an online video at YouTube, or enter the video’s online address. As shown, the search results window gives you the opportunity to preview a video by clicking the View Larger button.